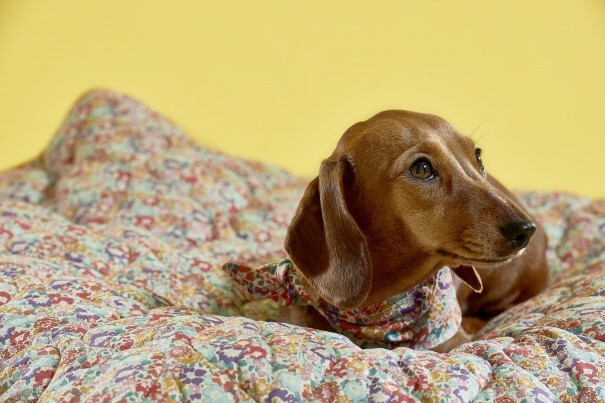 Inspired by the kind of antique bedding you might see in your bohemian granny’s cottage in the rolling countryside, the LovemyDog Ada Dog Quilt features a vintage Liberty Print on one side and pure cotton chambray on the reverse. Hand crafted and lightly quilted it is ideal to protect your chairs and beds and so comfy for your dog – wherever they like to sleep. ” I particularly wanted something stylish but practical to go on my bed to stop Rabbit getting mud and marks on my bedsheets. Although he’s not really allowed in the bedroom he sneaks in there when I’m not looking!” says Creative Director Lilly Shahravesh. 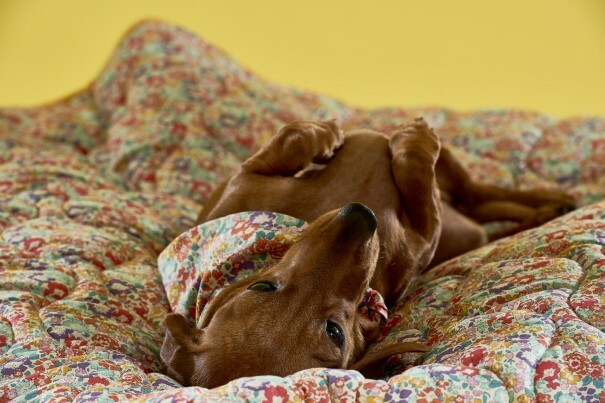 Lettice the Miniature Dachshund is nestled in all cosy as you can see in the photo above but this bed spread is big enough for larger dogs like Labradors too. The Ada Dog Quilt is hand crafted in the UK and machine washable. Have dog, will travel: we’ve selected our favourite pooch-friendly places to stay in the UK and beyond. There comes a time when you have to ask yourself: do I want to take the dog on a blissful luxury escape with me? The answer is probably no. Until you see their face, mid-packing, that is. Sometimes, we just can’t shake the injustice: leaving our pooch behind riddles us with kennel guilt, but taking them opens realms of uncertainty. Where will we stay? Where will we eat? Drink? Relax? Our holiday tips for happy dogs can provide you with plenty of alternative kennel options; but if you’re raring to take Buster on a doggy holiday, we’ve rounded up our the most beautiful places to stay. 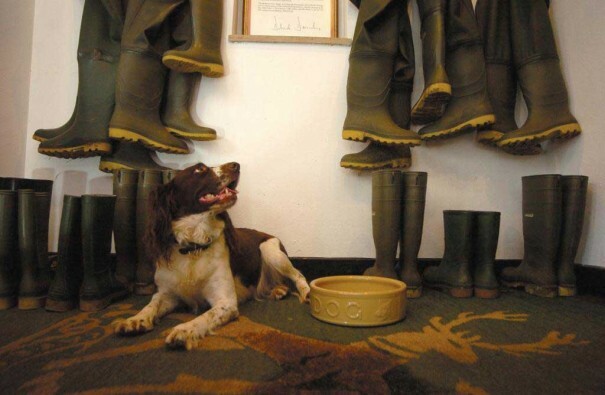 The Devonshire Arms claims to be the most dog-friendly hotel in Yorkshire – and we can see why. The country house and spa pulls out all the stops for four-legged friends: we’re talking a dog lounge, pet-concierge services (who think of everything), and even specially designed four-poster beds you can book to make your pup feel like Lord of the Mutts. Don’t let them get too comfy though; there is plenty of walking to be done in the Dales – the walk alongside the River Wharfe from the hotel to Bolton Abbey is an absolute treat. Top tip: The great British weather has a habit of catching us out. Make sure your tail-wagger is suited out in the finest raincoat – this Liberty Print cotton raincoat is fully waterproof and exquisitely stylish. 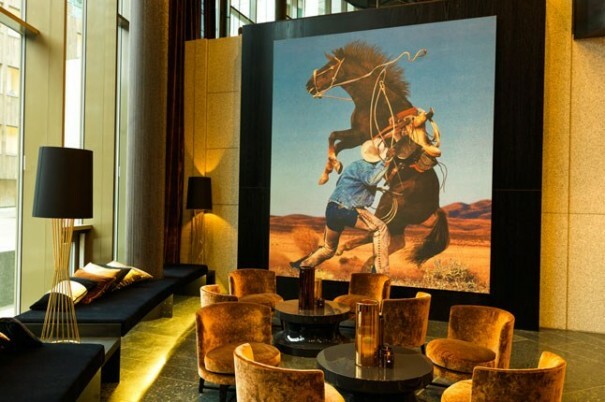 Grab yourself a doggy passport and head to The Thief, Oslo’s art-laden luxury hotel that values woofs as much as its Warhols. Expect sleek design, unique spa treatments and even a disco-ball-inspired suite for boogie nights aplenty. Pups are treated to a VID (Very Important Dog) hamper with toy, treat and clean-up bags on arrival. 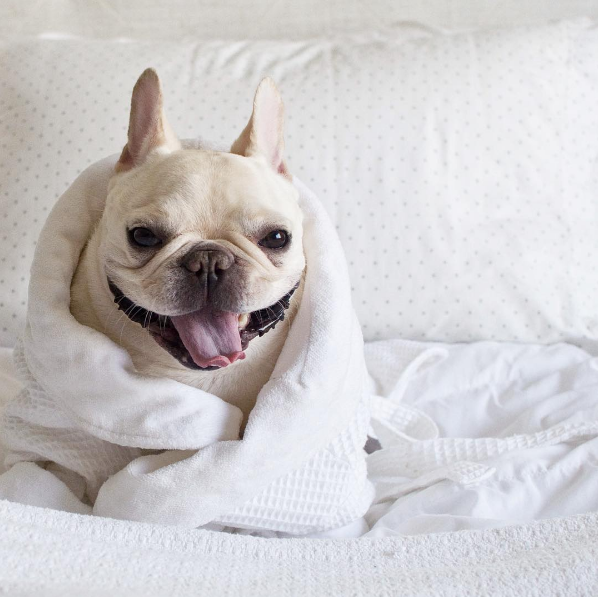 All doggy amenities can be added to your room; including a special canine room service menu, dog-walking and sitting services (the pool beckons), and even birthday parties. Top tip: Dogs can travel to continental Europe with the EU Pet Travel Scheme. 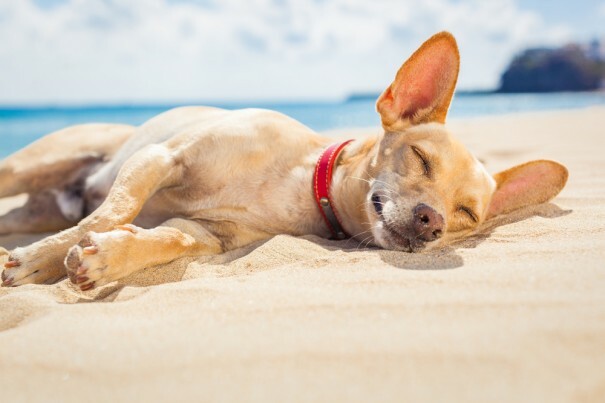 Read our doggy holiday guide for more info on passports and other requirements. Nothing says doggy holidays like an escape to the country. Airbnb property The Byre is straight out of a Beatrix Potter book; hidden away down the deep lanes of Devon. 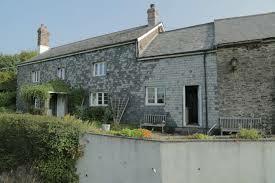 Plus, it’s all yours: the spacious cottage, tranquil garden and 27 acres of ancient woodland. As well as the surrounding wildlife, the property has a smallholding of horses, ponies, goats, chickens, cats and one dog (plus yours, when you get there). Top tip: Is there a chance your dog may go slightly bonkers at the sight of a chicken be put on a lead? If so, The Byre hosts request you put your pooch on a lead. 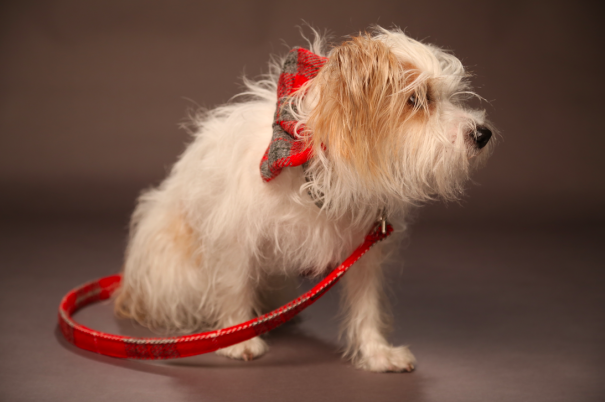 For something stylish, sophisticated and long-lasting, this red velvet dog lead is the one. This is British hospitality at its finest. As well as award-winning dining, elegant rooms and plenty of indulgence for humans, The Goodwood Hotel rolls out the red carpet for dogs. 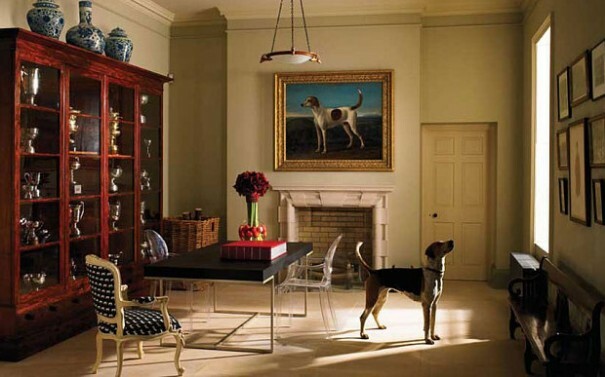 And that’s no overstatement – pooches actually gain access to their very own private members club here – The Kennels. 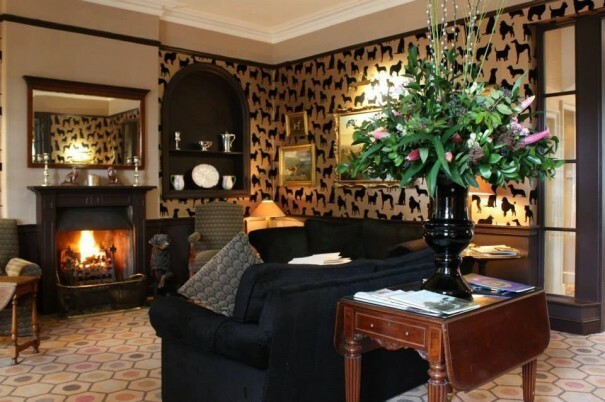 Spend a night in the Hound Lounge where you will be serviced by a Goodwood butler, treating your pampered pup to impressive treats, such as organic pig ear. Dog-friendly walking maps are also on hand to plan out a brisk walkies in the beautiful surrounding estate. 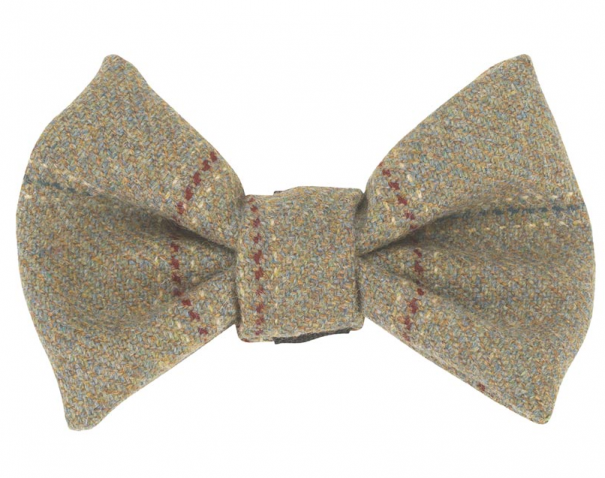 Top tip: Make sure your hound looks the part, with this oh-so-British tweed dog collar. If there’s one thing you cannot put a price on, it’s crisp Alpine air. Take your dog for the trip of a lifetime in the heart of the Swiss Alps: rich, verdant meadows await in summer… and in the winter? Ski-heaven. 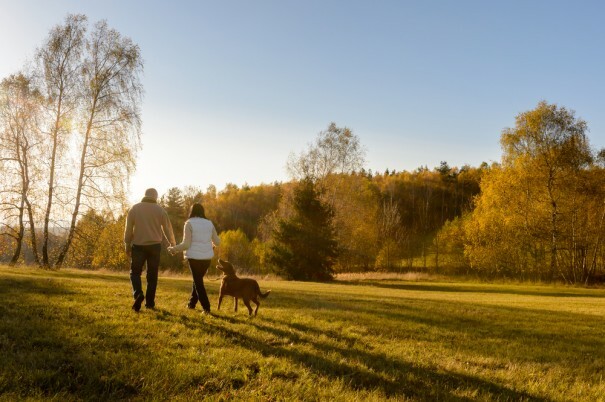 The Cambrian hotel is your perfect base to explore that stunning landscape; offering a luxurious spa, restaurant, hydrotherapy pool and (very important) accommodation for dogs. Pets can stay at the ultra-modern hotel for CHF35 a night (about £27). Top tip: If you’re heading out in snowy climates, make sure you’ve got your dog’s attire all wrapped up. We’re talking striking, showerproof, hand-cut coats; like this red harris tweed number inspired by the stars of the 1960’s. Any place that has two resident Great Danes and three pugs is a winner in our books. 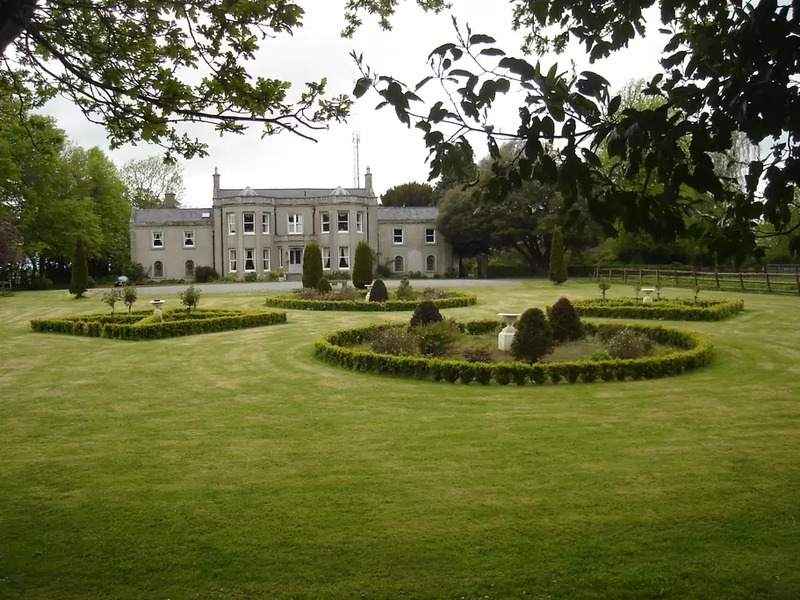 Even better if it’s located on 12 acres of glorious dog-walking grounds in the beautiful Irish countryside. The Sheehys at Springfrield B&B is a Georgian manor house in County Kildare – and a paradise for pet-owners. Expect fabulous rooms filled with antiques and art, pristine gardens and homemade baked goods from the Airbnb hostess, Libby. You won’t be short of things to do; horse riding, golf, fishing and shopping are all within a few miles with easy access. Top tip: You’re staying at an Irish manor – what to wear? Not you, the dog! Keep your mutt nice and toasty from the wind in this yellow snood made from 100% pure wool. 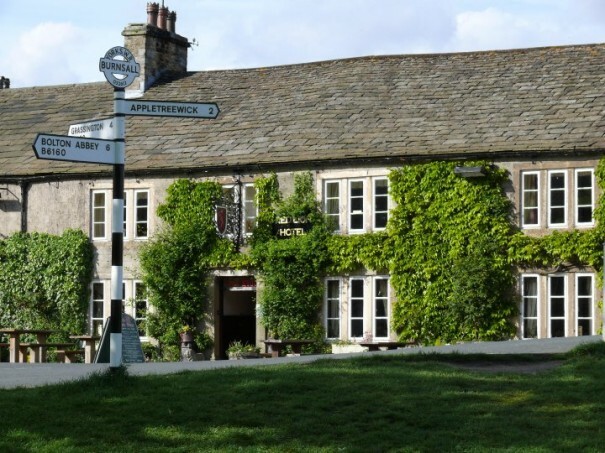 Wilderness rambles and an English country pub: it doesn’t get much better. Unless you’ve got a dog trotting alongside. Here’s our guide to the UK’s best pet-friendly pubs and nearby walks. From Cornwall to Cumbria, there’s little to beat stretching the legs and lungs in the good old English countryside. Add the tempting lure of a traditional pub garden on a sunny afternoon and all’s right with the world. 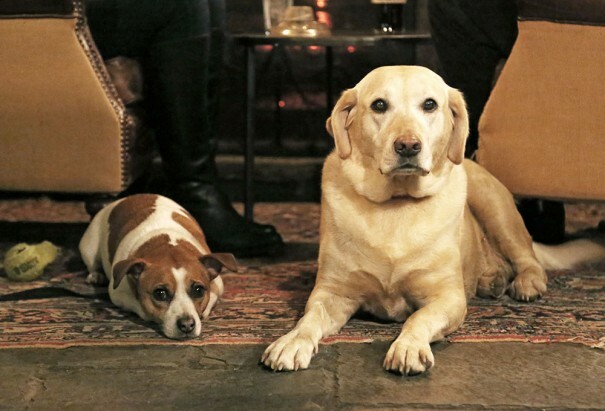 Here’s our edit of the best dog-friendly pubs with a handy stroll close at hand. There’s a two-for-one on this circular walk, with the Rattlebone Inn at beginning and end in Sherston, with the King’s Arms at Didmarton marking the half-way point. And they’re both seriously chic. The King’s Arms is all leather armchairs and picture windows, looking out onto a voluptuous country garden for sunny days. And they know their weekend market: supper is served until 10pm on a Friday night, so you can whiz down straight from the office after a long week and not go hungry. It’s got spot-on canine credentials too. Resident dog-in-chief Spoof the Jack Russell is on standby for playtime and they even serve a doggy beer, Snuffle (yes, really). If you decide to hole up here for the weekend, four-legged guests are as pampered as their two-legged pals, with dog beds and treats available in the super chic rooms. As for the Rattlebone Inn, no-one can say it lacks pedigree. A former favourite haunt of Prince Harry and friends, its modern bistro cuisine and real ales continues to attract the smart set. If you’ve any energy left after your walk, there’s a skittles alley and three boules pitches in the garden. Ramble route: Start your walk at picture postcard-pretty Sherston, taking a circular route, mostly through open farmland. The walk follows the River Avon upstream through the gentle slopes of a valley. Grab a leisurely beer at The King’s Arms and you’ll head back towards Sherston on a different path, ending up back at the Rattlebone Inn. 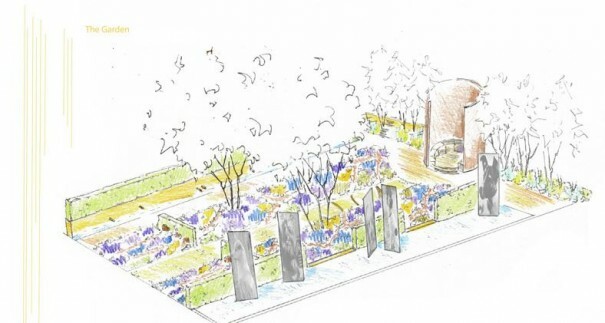 If you’re lucky, they’ll have fired up the spit roast and be serving Argentinian Lamb Asados in the garden. Thirsty travellers have been stopping in (and stumbling out) of this historic coaching inn for more than 400 years and they’re more than happy for pooches to pop through those historic doors, too. The Black Bull doesn’t have the Farrow and Ball chic of the Cotswolds pair but it does have one big plus point. Out back, the pub has its own brewery, the home of Bluebird Bitter. 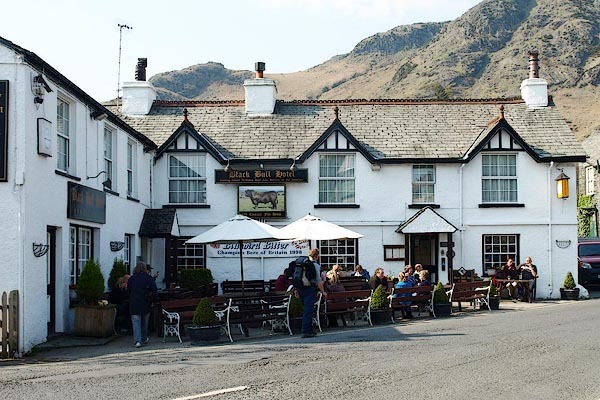 The Old Man mountain serves as a dramatic backdrop as you enjoy a fresh pint with your dog at your feet. But go easy, you’re going to be climbing that bad boy. Ramble route: This circular walk is a proper hike, rather than a Sunday stroll, so it’s not for wimps or pups. You’ll zig-zag up the side of Stubthwaite Crag and finally peak the Old Man of Coniston, which clocks in at 803m. The stunning views are worth it though – and you’ll welcome that drink when you head back to the Black Bull. Strike out into the countryside kitted out in the best of British design. 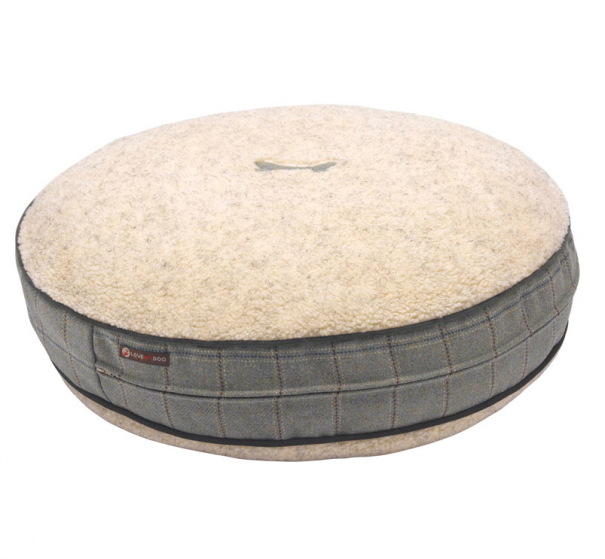 Treat your dog to a little something from the Appleby range, made from genuine Harris tweed. There’s a reason this fabric’s an enduring fashion favourite: as well as being super stylish, it’s tough enough to cope with snags from thorns, lasts for ages and washes beautifully. Perfect for the four-legged countryside gent (or lady). Looking for the authentic Yorkshire Dales experience? Burnsall’s just the baby. Historic stone buildings, Instagram-wowing river views and a slightly bonkers feast day (with games) every August. The Red Lion is in the heart of the village, where it’s been packing ‘em in since the 16th century. The food has an AA rosette and the menu goes on for ever… (fussy eaters take note). There’s a resident Jack Russell called Totty (what is it about pubs and Jack Russells?) and say hi to the Grayshons; they seem to rope in every generation to work in this genuine family business. Ramble route: This is proper walking country. Wharfedale is on your doorstep and Burnsall is the first stop of the Dales Way, which runs from Ilkley to Windermere. 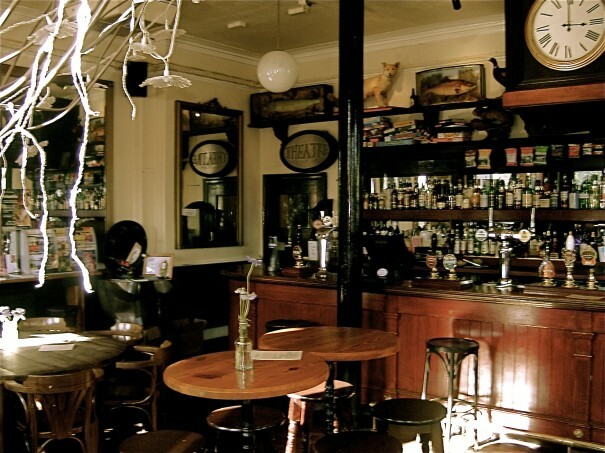 Ask the right people in the bar and they’ll tell tales of trolls that haunt a nearby limestone gorge, a wolf-infested ravine that inspired The Hound of the Baskervilles and caves housing flesh-eating boggarts (no, we don’t know either). Personally, we’re more nervous of the mad fell runners, who race up Burnsall Fell every August. Instead, strike out along the side of the glittering River Wharfe, with plenty of spots to jump in for doggy paddling. There’s a set of notoriously-slippery stepping stones (don’t worry, there’s a creaky but fun cable bridge if you don’t want to get wet) but other than that, the going is easy. There’s a circular 2.4 mile journey that takes in the best views in Burnsall, or press on to Bolton Abbey, the gorgeous, sprawling Yorkshire estate of the Duke of Devonshire. Dogs on a lead are welcome in most areas – check out the exclusions here. 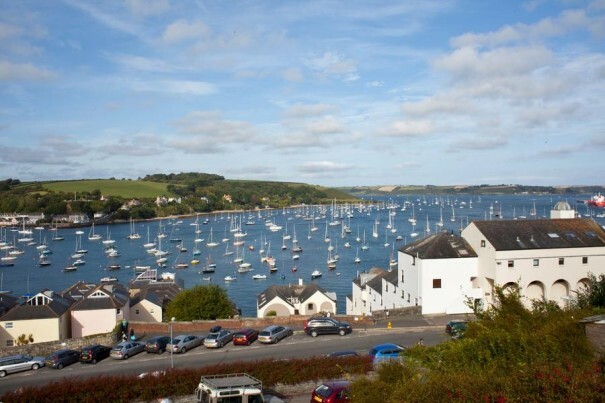 It’s a clamber up to the Boathouse but the view down across Falmouth Harbour makes it worthwhile. The hearty seafood-with-a-twist menu is a pretty good incentive too. They’re big on live music and guest ales. 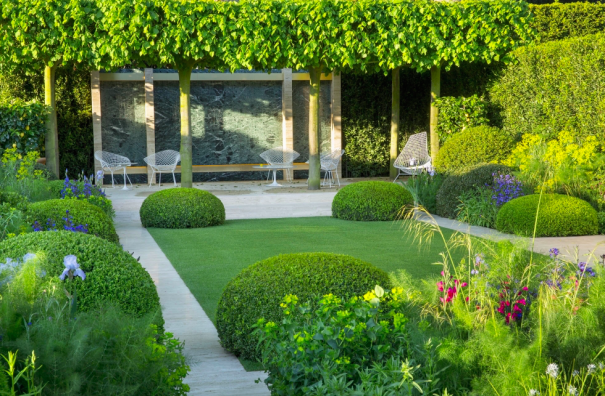 Oh – and apparently they’ve got a bonsai tree that looks like Kim Kardashian’s most famous asset. 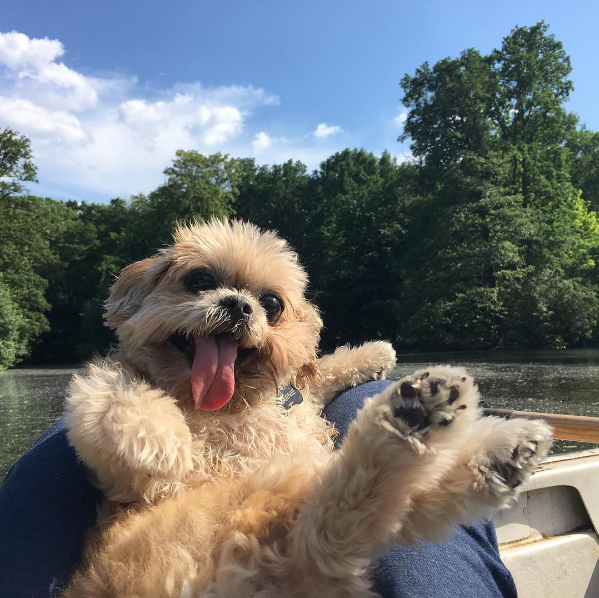 Follow these feel-good pooches – immediately! Some people think Instagram is a place for food, sunsets and legs in the bath. They’re wrong. Instagram is the place for dogs. 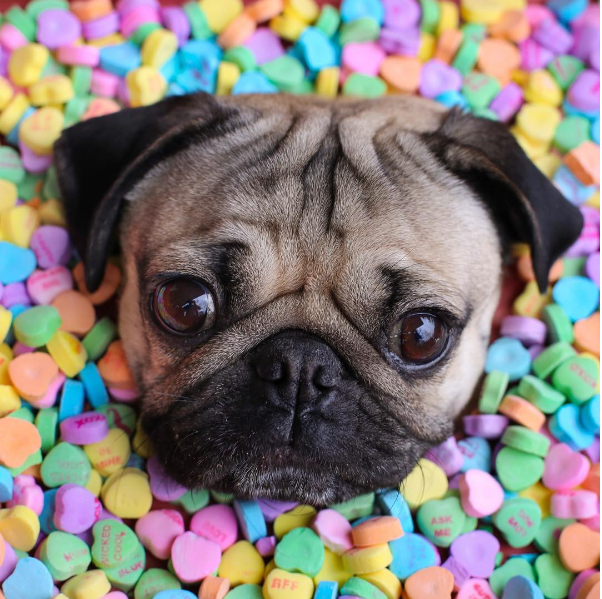 From tiny corgis to hipster pugs, there’s no shortage of loveable canines to make your feed the happiest ever. Too many to choose from, in fact; so we’ve narrowed it down to five of our favourites to get you started. Who is he? The underdog with the overbite. Chiweenies are a cross between a chihuahua and a dachshund. They’re also obscenely cute, as you’ll learn if you spend as much time as we do fawning over Tuna Melts My Heart’s Instagram feed (which is a lot). 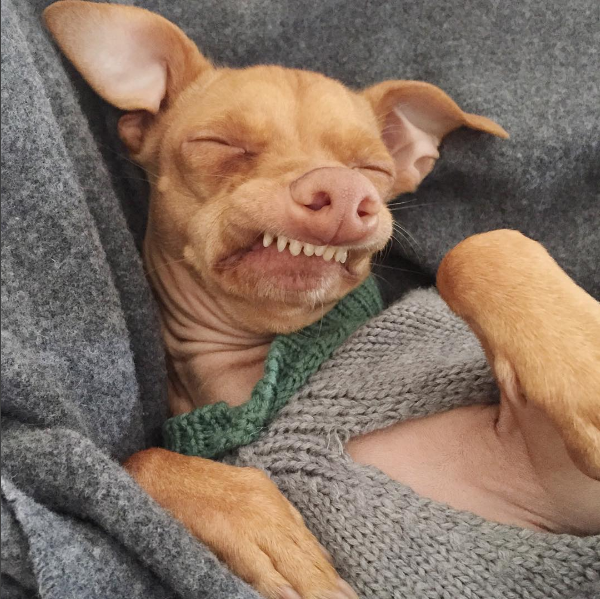 With his pronounced overbite and wrinkled-up chin, Tuna is an endless source of reaction faces for every situation. Oh, and did we mention he has impeccable fashion sense? 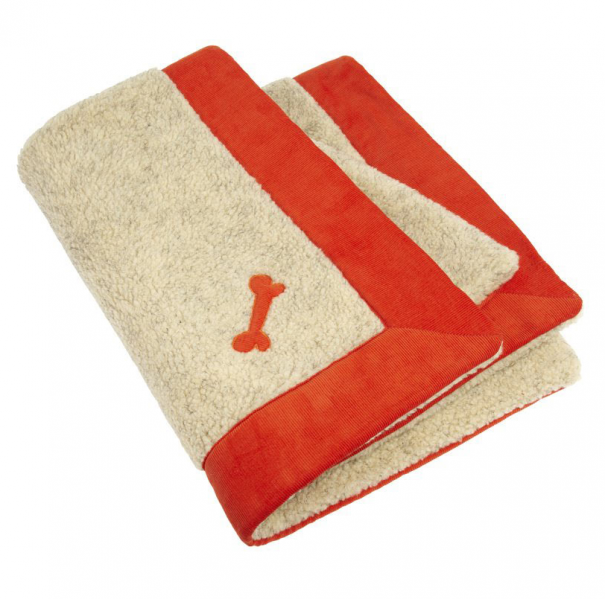 Chiweenie chic: Channel Tuna’s off-duty cool by wrapping your pooch in this corduroy dog blanket. Raffishly retro. Who is he? The self-declared king of pop culture. It’s official. 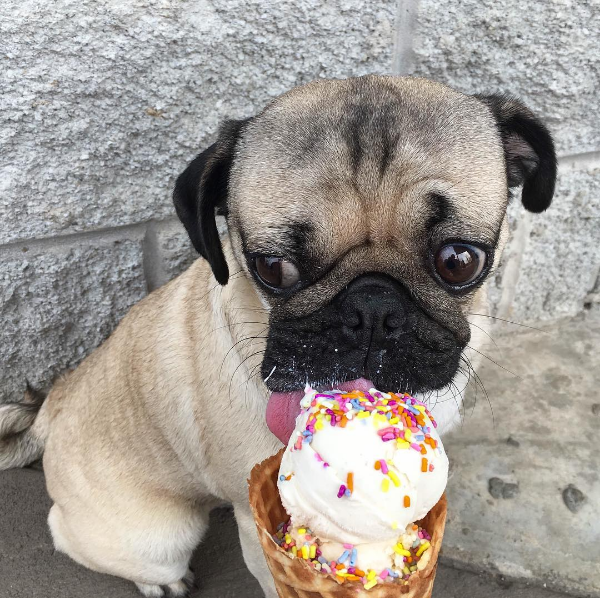 Doug the Pug is our spirit dog. If he’s not basking his wrinkles on the beach, he’s dressing up as Harry Potter, salivating over wine and pizza, or meeting Dolly Parton on the red carpet. But his life isn’t all about the glitz and glam: Doug is a also registered therapy dog with a charity called Pets As Therapy; showering care homes, hospitals, hospices and schools with pug-tastic joy. Puggy style: With so many celebrity jamborees to grace, Doug needs to travel like a VIP. 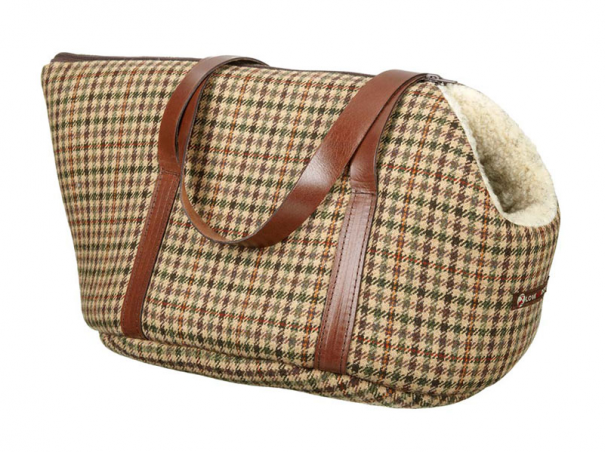 This Sidworth tweed designer pet carrier is oh so smart – and ridiculously cosy. Who is he? A Frenchie, and complete and utter heartbreaker. The hippest name in the doggy world, the sharpest dress sense and the biggest smile; Sir Charles Barkley the French bulldog is a joy to follow. There are also excruciatingly adorable throwbacks of baby Barkley on a regular basis too (just in case you weren’t smitten enough). Frenchie dressing: Got a Sir Charles B of your own? 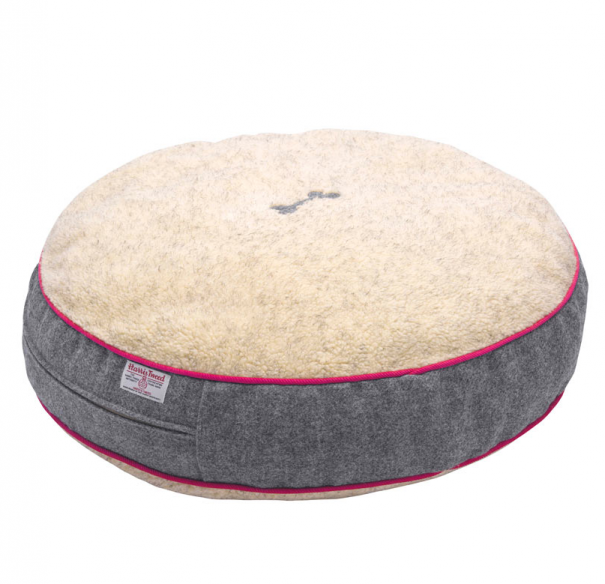 Treat them to this grey harris tweed dog bed for wrinkly snuggles galore. Who is he? 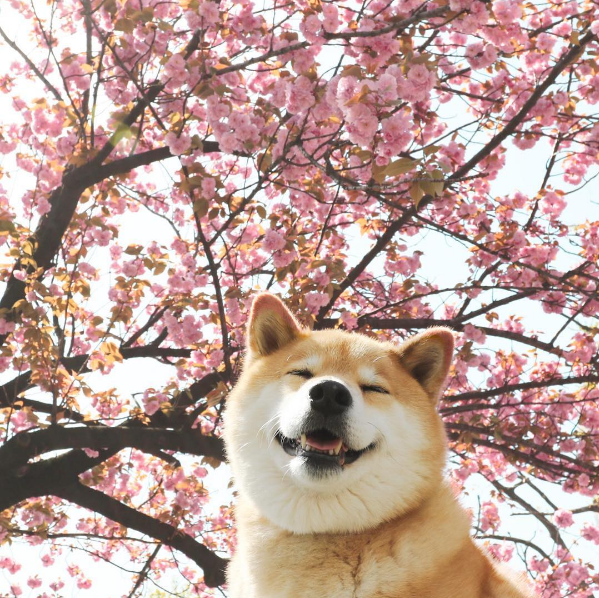 The happiest, fuzziest shiba inu on Earth. Can we be honest? We’re really, really jealous of Maru. Not just because he has the most chilled life ever with his owner in Japan, but because he’s more photogenic than we’ll ever be. Follow him for his joyous smile, infinitesimal fuzz of fur and general handsomeness. King of Shiba: Maru, are you reading this? We really need to see you modelling this Bow Wow handmade dog bow tie ASAP. You gorgeous devil, you. Who is she? 14-year-old shih tzu that’s gone from stray to star. Completely fabulous. 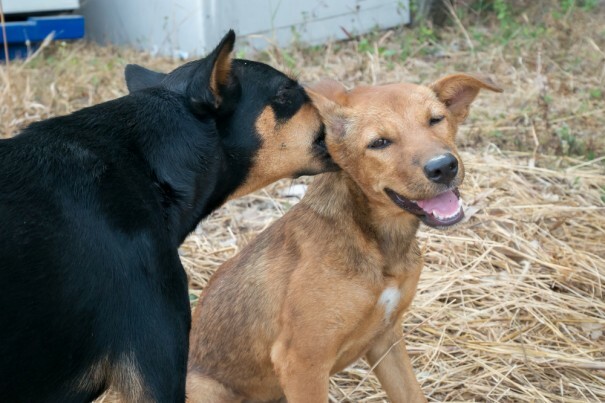 Young pups often take the limelight in dog shelters, but Marnie The Dog is changing all that. This senior lady, famous for her cheeky tongueand head tilt (caused by vestibular syndrome) is raising awareness of older dog adoptions, having been adopted herself at age 10. She was found partially blind and in a frightful condition. Now, she can be found occasionally falling into the arms of celebs like Taylor Swift and Tina Fey. Amen to that. 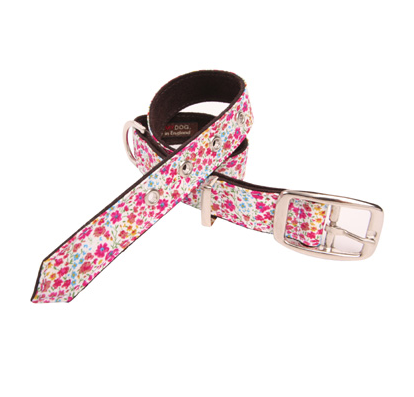 If the shih tzu fits: Give your pooch some sartorial flower power with this Amberley Liberty print dog collar lined with buttersoft suede. Which breeds reign supreme? In celebration of Her Majesty’s official birthday this weekend we take a glimpse at the legendary companions to royals and rulers. 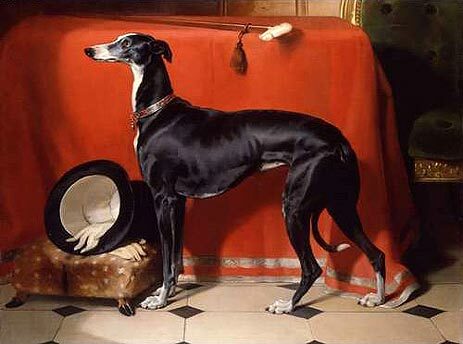 Handsome greyhound Eos was given to Prince Albert in 1833 when the future Prince Consort was just 14 – and they soon became as thick as thieves. The duo spent six years in Albert’s native Germany before embarking on a new adventure together; a move to England, following his engagement to Queen Victoria. Eos – fond of plum cake and hunting – was always Albert’s dog but he soon became a much-loved favourite, adored by all the royal household. 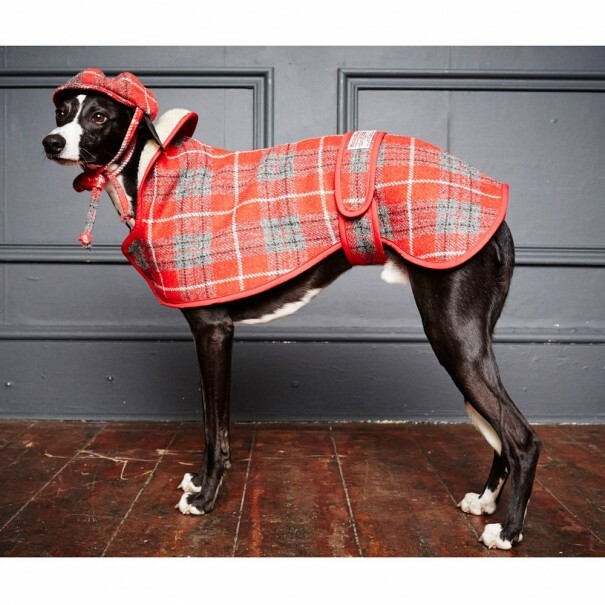 Royal match: Cloak your greyhound in this tartan coat for a chic look. While Churchill’s legacy is headlined with his tactical battle choices, he was also well-known as a keen animal lover, counting a budgie called Toby and Nelson the cat among his friends. When it comes to dogs, the British war leader’s fighting British spirit meant he has long been associated with the bulldog. In fact, his personal pooch preference was a poodle named Rufus. Rufus accompanied Churchill throughout World War Two before he sadly passed away. 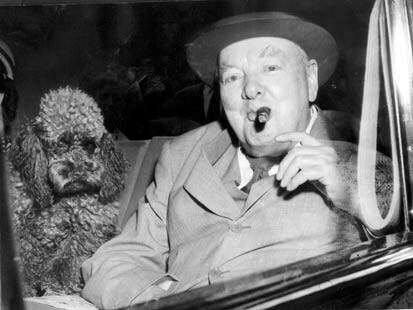 But it wasn’t long before another poodle joined Churchill’s inner circle. His name? Rufus II. 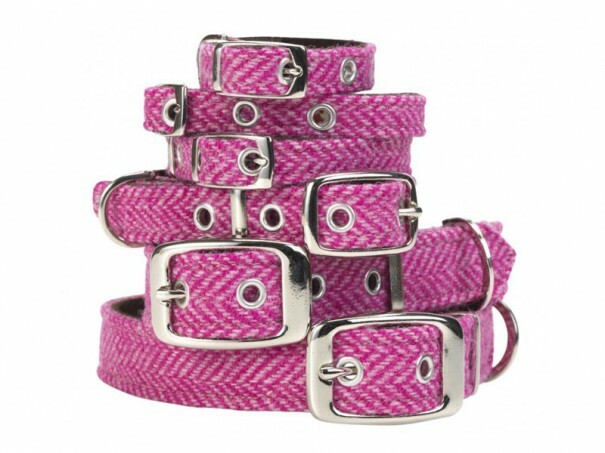 Royal match: Complement your poodle’s coat with this stylish pink tweed collar. Lupo was a wedding gift to the Duke and Duchess of Cambridge from Kate’s brother James Middleton in 2011 and has since become a key member of the royal household. The English Cocker Spaniel was even have said to have picked out Prince George’s name after the couple scattered choices on paper across the room and he sniffed out his favourite. 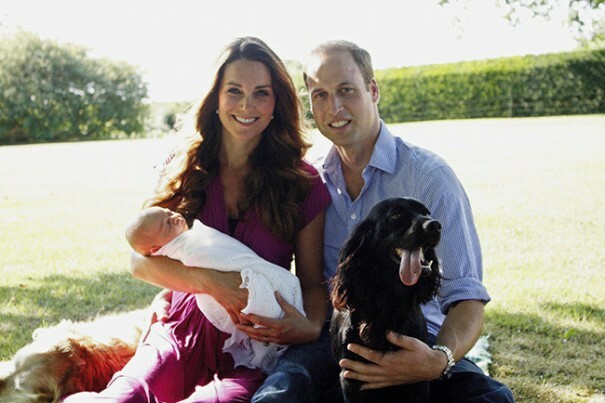 The pretty pooch has also featured in the tight-knit family’s official portraits since the birth of Prince George – just look at that smile. Royal match: Is your dog a cocker spaniel, too? 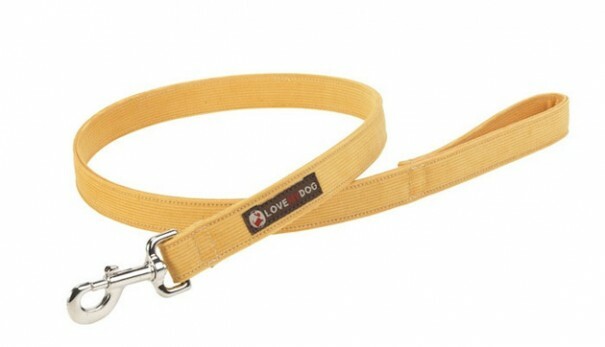 This stylish lead in yellow will contrast gorgeously against her glossy coat. 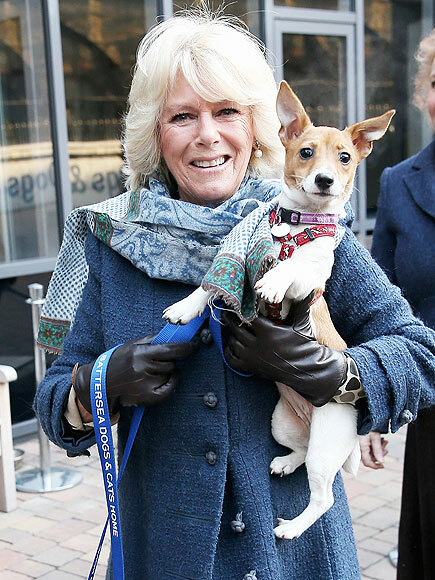 Having grown up with dogs and cats, it’s no great wonder that Camilla, Duchess of Cornwall, has become a keen supporter of animal welfare. 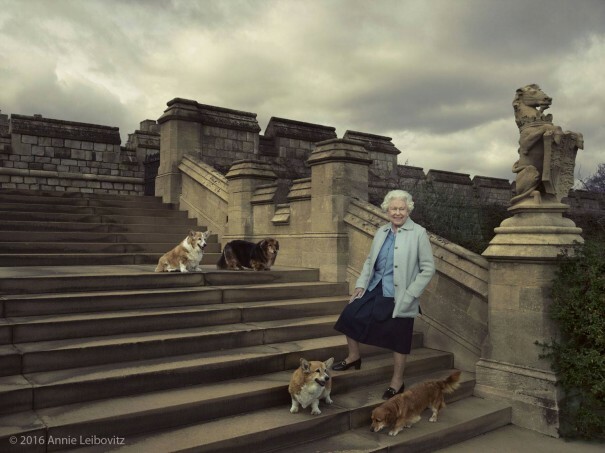 Beyond making the royal rounds at various animal shelters and homes, Camilla has owned several generations of Jack Russells and has most recently picked up two rescue pups from Battersea Dog’s Home; Bluebell and Beth. She is regularly spotted with the companions by her side. If the thought of putting your dog into boarding kennels makes you twitch, you’re not alone. Although many pet hotels are flashier than some human hostelries, we just can’t shake the guilt. Fortunately, there’s a growing market of alternatives. 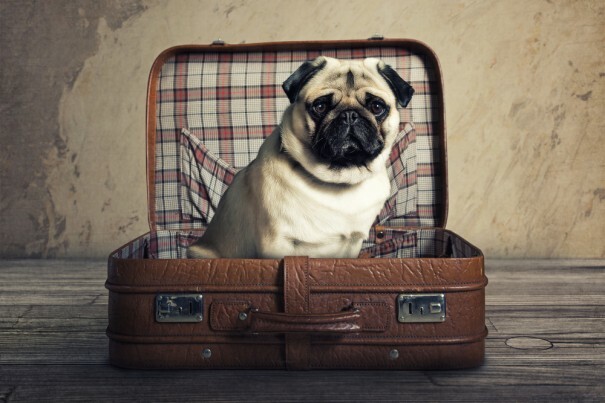 From home-sitters to doggy passports, we’ve found the best ways to travel guilt-free. Extra walks, sloppy kisses and ear ruffles guaranteed (for the dog, of course). Taking dogs abroad is a growing trend. And – as long as your pet is a happy traveller – it’s easier than ever. Dogs can travel to continental Europe with the EU Pet Travel Scheme. They’ll need an EU pet passport, a microchip, a rabies vaccination and a tapeworm treatment. Rules vary for most other countries but all the information you need is on the Defra website. Bear in mind that only certain transport companies and routes allow dogs to travel abroad: download a list of them here. Your doggy jollies await! Top tip: Travelling can take its toll on all of us, especially a little pooch. Make sure you have something comfy to carry them in: this Rivington Tweed designer dog carrier is ultra stylish, extra strong and so cosy you’ll wish you could fit in it yourself. 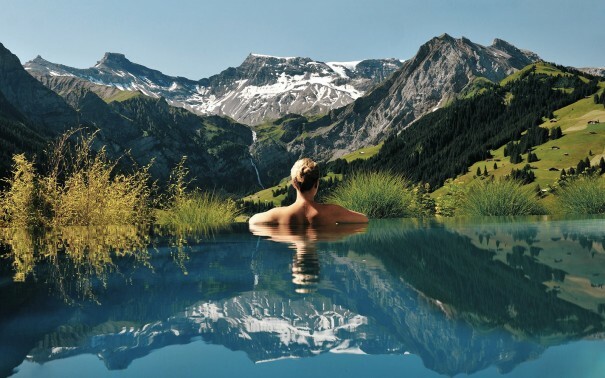 Staycations can be just as amazing as jetsetting. Plus, plenty of places in the UK permit dogs. Best Western has won awards for its pet friendliness: it even offers a special doggie menu at some hotels (leash and potato soup, anyone?). Airbnb is another great place if you’re looking for self-accommodating stays: all listings state if pets are allowed (if they don’t list it, it means they’re not). And if you’re looking for something special, The Telegraph has rounded up five hotels where dogs (and humans) are treated like royalty. Of course, you’ll want to head out. 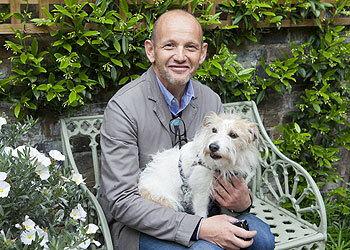 For places you can eat without leaving your dog, type your destination into DoggiePubs. The website recommends hundreds of places serving food and drink across the country. Top tip: If all else fails, grab a doggy blanket and go for a picnic. 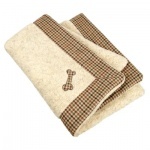 This pure wool Sidworth Tweed dog blanket channels the Knightsbridge ‘ladies who lunch’ vibe to a tee. The ultimate pooch-sitter is one that you know and trust. If you’ve got a friend or family member with their own dog, organising a reciprocal arrangement can be exceptionally handy. You look after their dog when they travel and vice versa. Top tip: Relax! If you’ve taken the proper steps to ensure a happy holiday for your dog while you’re away, then enjoy it. You can always buy them a present for when you come back: this yellow Bow Wow dog bow tie is smart, sunny and easy to slip onto your dog’s collar. There are hoards of dog lovers out there, willing to look after pooches simply because they adore them, not to get paid. More than 300,000 of them are on BorrowMyDoggy alone. 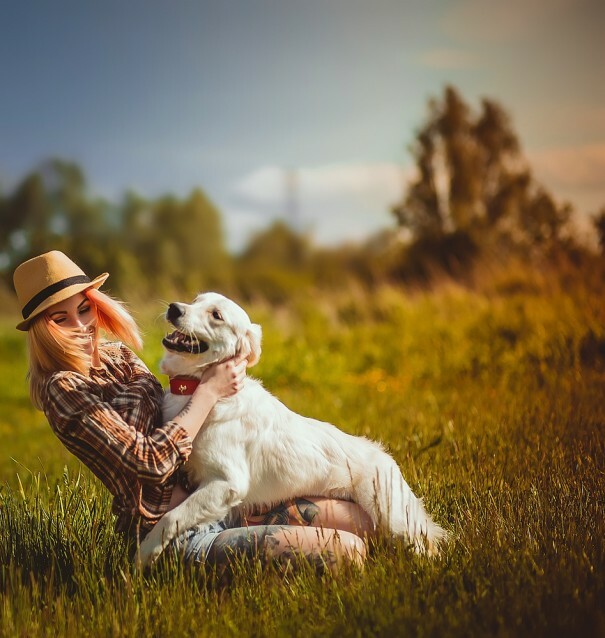 The site connects dog owners with local dog lovers, so you can find verified local borrowers and meet them for a ‘Welcome Woof’. Not only can it save you a small fortune in kennel costs, you know your dog is going to have a fantastic time. Annual memberships cost £44.99, which includes 24/7 vetline, third party liability insurance and the chance to find a great friend for your pooch. Top tip: Leave a checklist for your dog sitter. Include your dog’s feeding schedule, how often to check their water bowl, any behavioural problems, where they are/aren’t allowed, when to give them a treat and important information such as the vet’s phone number and address. Remember to make sure your pet is cosy and easy to spot on walks while you’re away. 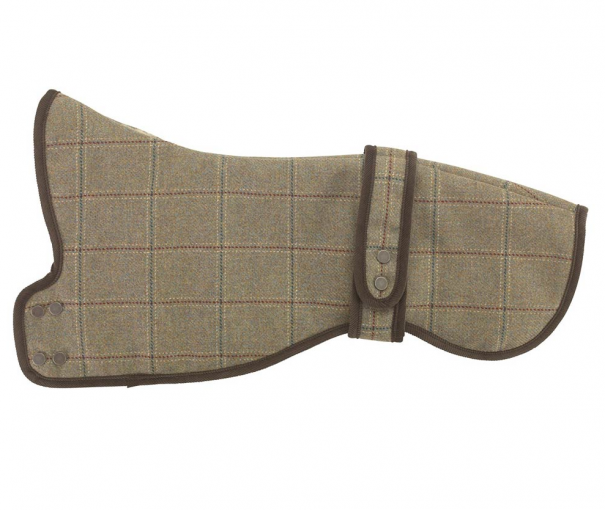 This Hoxton Tartan Harris tweed dog coat is made from a tartan design designed by and exclusive to LoveMyDog. Pressies for pooches? We’ve got five of the best. Buying a treat for a very special dog? Fit the gift to the owner with our guide. 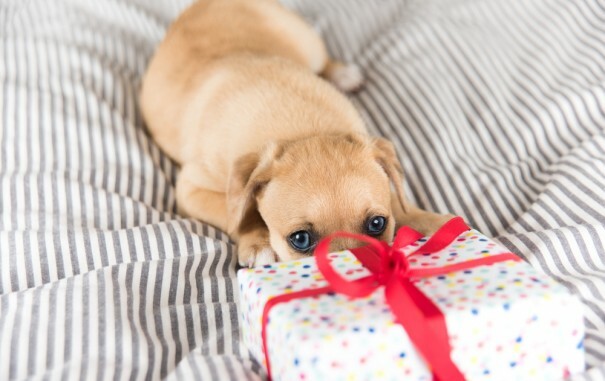 Whether you’re seeking a quirky fashion statement, the ultimate pet-tech or a personalised treat for home-comfort cravers, our gift guide features five of the best – and there’s one to suit every owner’s personality. Know a dog owner who’s crazy about their FitBit? 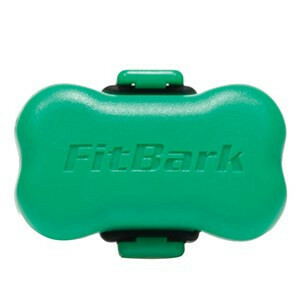 The FitBark (£59.95) is already a hit stateside and making headway this side of the pond too. Track the pooch’s health and behaviour, while the accompanying app lets them share the data and photos with their friends and vet. Available in five lovely colours – we like ‘free spirit’ green. Who’s your best-dressed friend? 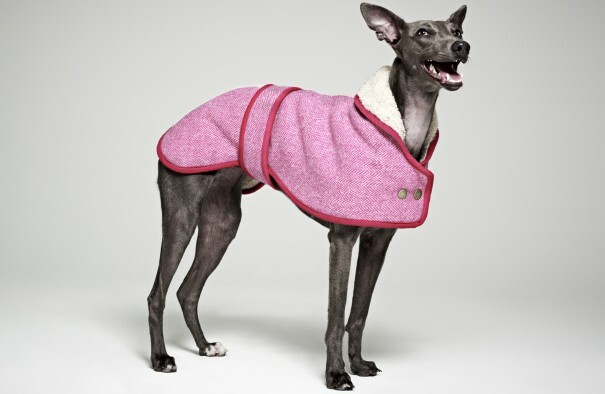 Treat their equally elegant hound to a touch of sartorial style. 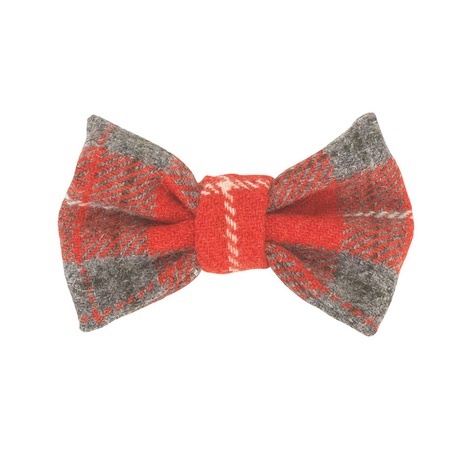 This dog bow tie (£22.95) is made from the finest pure new wool and is perfect on its own for a jaunty touch of class – or as part of the Harris Tweed Hoxton collection – a design exclusive to LoveMyDog. Just make sure they head somewhere busy for walkies, as there’ll be plenty of admirers. Which foodie is likely to turn up their nose up at run-of-the-mill doggy drops? 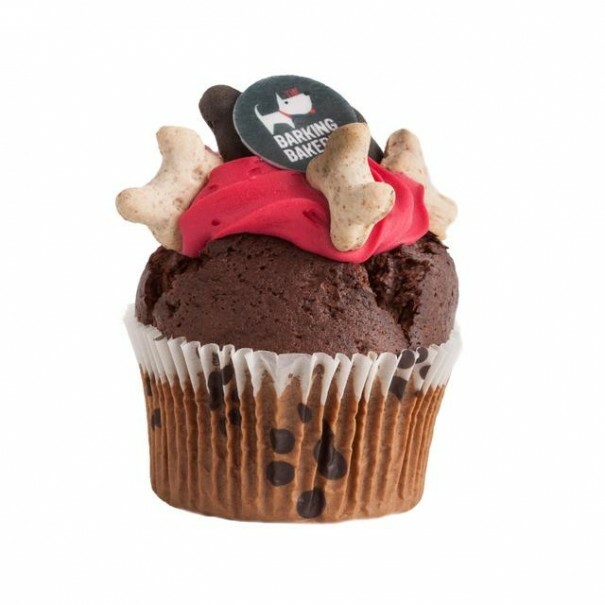 This ‘woofin’ (£3.49), straight from Ocado’s pet patisserie will take your furry friend’s taste buds to new levels of delight. The fluffy carob sponge is complemented by a generous dollop of pink yoghurt icing and decorated with bone-shaped biscuits. It might only last ten seconds but it’ll be ten seconds of unadulterated doggy bliss. 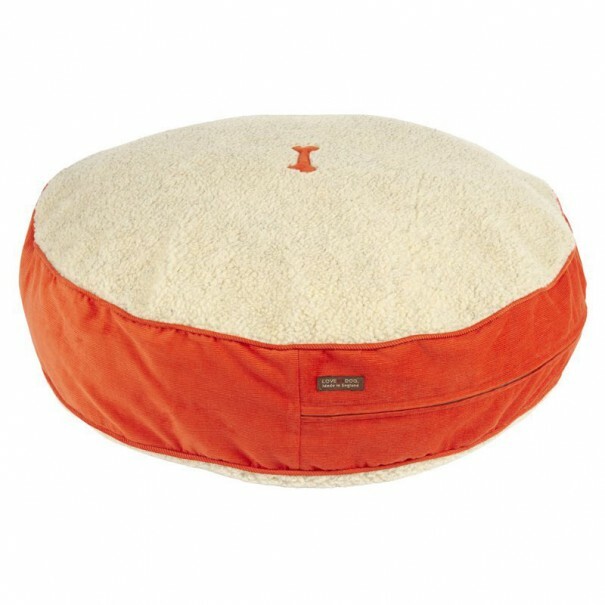 Curling up for a nap will never be quite the same again once their pup can revel in the luxury of the Spencer dog bed (£155), crafted from soft needlecord and finished with Sherpa fleece. If you know an owner who takes creature comforts seriously, this is one gift which will score big. It comes in three sizes, an array of colours (we love perky orange) and you can even personalise it, for extra brownie points. The Pet Spa in Chelsea is an unrivalled retreat for the pampered pet – and has plenty of treatments to choose from, including mud baths, reiki or a simple canine massage. 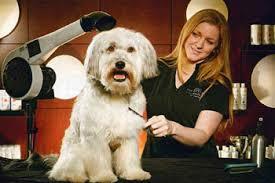 Book a frazzled owner in for a spa treatment and whisk their pet off for his own spot of TLC. 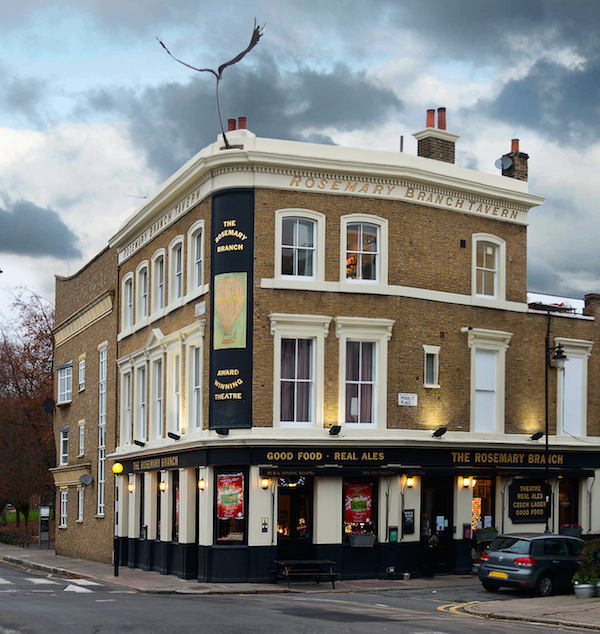 If you and your dog are stuck for something to do this weekend, check out The Rosemary Branch – our local dog-friendly pub, bar and theatre, just down the road from LoveMyDog towers. The restaurant is perfect for a spot of lunch with Rabbit and our doggy friends after one of our favourite walks down Regent’s canal. It is a fab, friendly and very quirky pub, which has won awards for it’s freshly cooked food… The Sunday lunch is legendary. The theatre is also well worth a visit and they have an events space available to hire.